A.J. Foyt epitomizes the Indianapolis 500. He’s a legend and his cars embody that legendary status too, even those that didn’t carry him to one of his record four Indy wins in 35 tries. 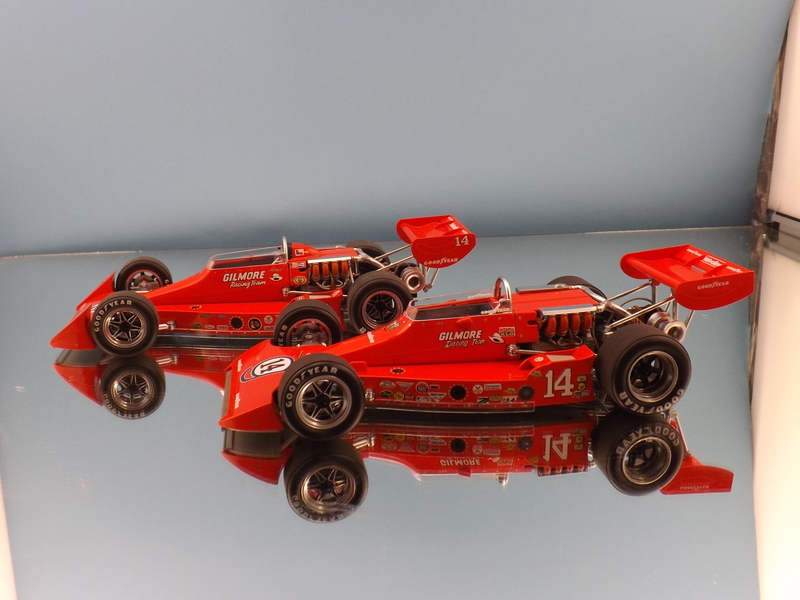 Replicarz continues to expand its impressive 1/18 scale Indy 500 collection with Foyt’s pole-winning Coyote from 1974, back when all the racers looked a bit different as each driver, mechanic and car builder experimented with wings for downforce and radiator positioning for proper engine cooling. 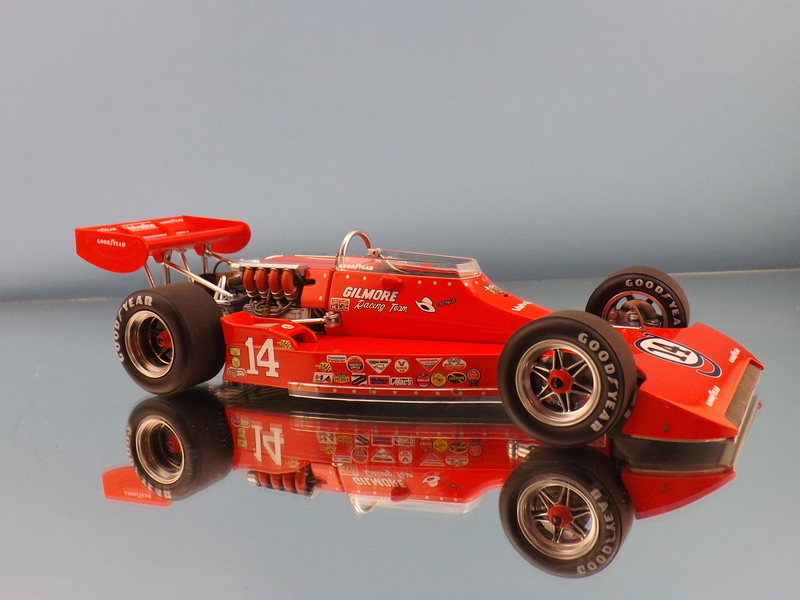 Foyt’s Coyotes of the 1970s all had similar features, but for varied from year to year, the only constant being their glowing orange paint schemes and the Gilmore Racing sponsorship along with A.J.’s traditional No. 14. 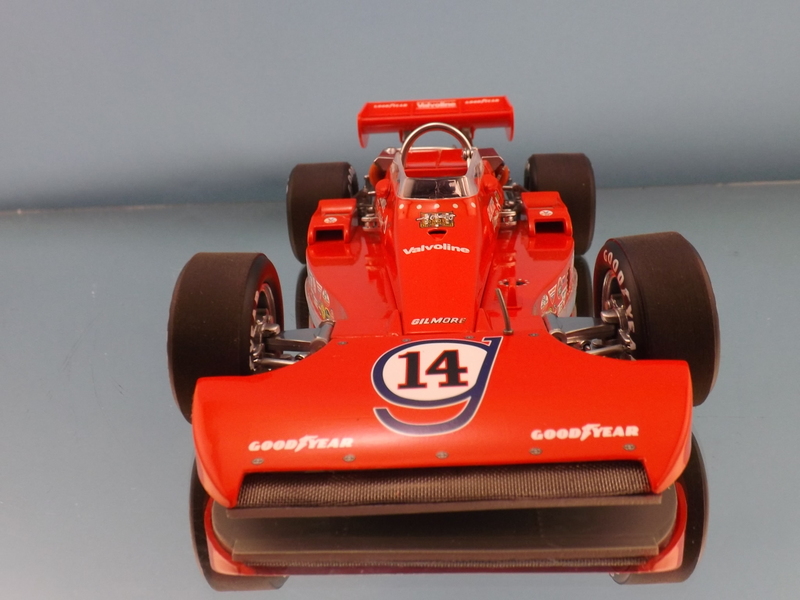 Front view of the 1974 Indianapolis 500 pole car emphasizes its wide nose. Foyt won the Indy pole in 1974 with a speed of 191 mph and had the speed to win on race day. He led 70 laps, second only to winner Johnny Rutherford, and controlled much of the first half of the race. He had just repassed Rutherford about 139 laps into the race when his Coyote started to smoke. He dropped out on lap 142 with a broken turbocharger scavenger pump and finished 15th. But Foyt drove the same car to eight poles and two race wins during the 1974 season and in 1977 a similar Coyote with different nose, tail and radiator mountings carried Foyt to his fourth Indy 500 win. 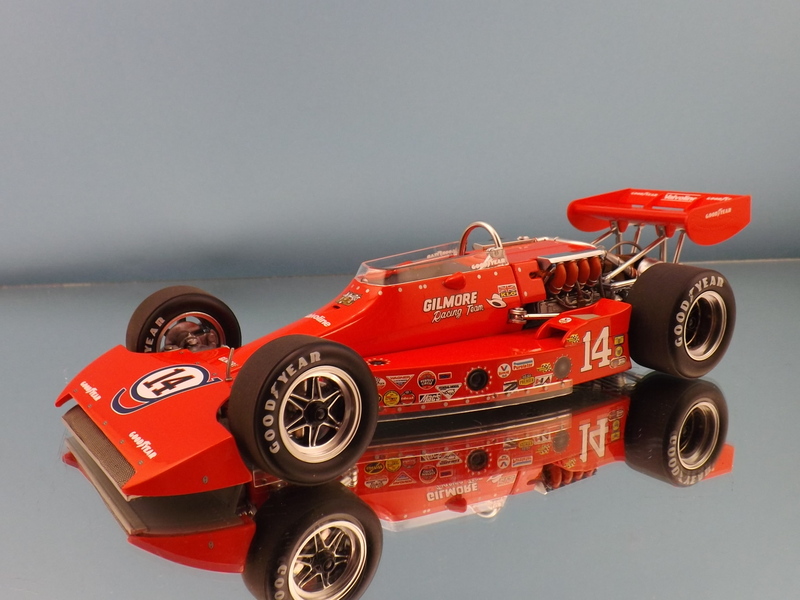 Oh, and Replicarz is releasing that 1977 Indy winner, along with this model, in July. Sharp detail on the engine, turbo and rear wing. Replicarz has created a sweet 1/18 scale Coyote with its usual attention to race-day detail from the gloss orange paint scheme to all the race-day sponsor decals along the side pods, no less than 22 on the left side pod. 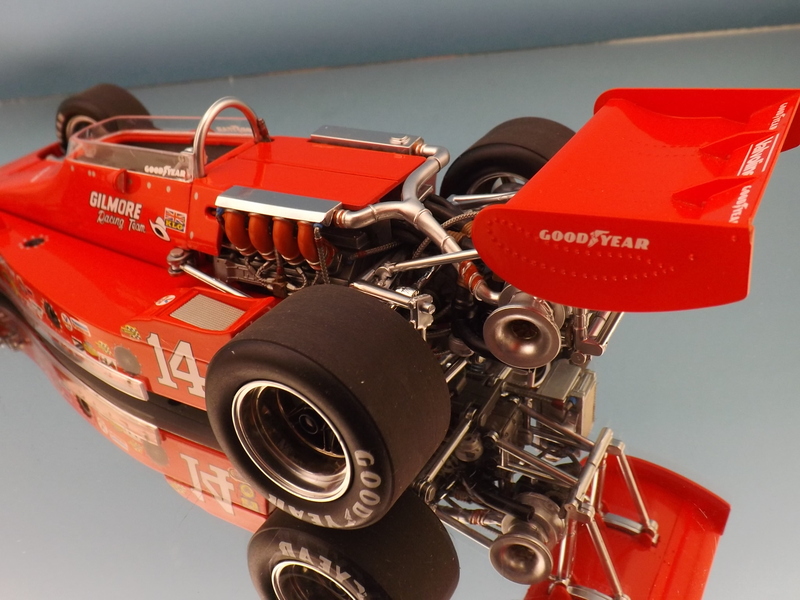 I think this is Replicarz’s most beautiful engine reproduction yet, the Foyt V8 with its cables and plumbing along with heat deflector, header covers and the detailed rear suspension that wraps around it adds much to the model’s realism. Naturally the engine cover pops off and has two pins that help hold it in place. The giant turbo in back, plus black exhaust and rear mounted radiator are finely detailed too as are the front and rear suspension pieces, brakes and braided cables running to each wheel’s brakes. Atop the side pods are metal grates that cover the air ducts just in front of the giant rear slicks, Goodyears, of course. Goodyear was the sole tire supplier for Indy Cars by 1975 as Firestone phased itself out in 1974. A.J. was solid with Goodyear. The wide polymer nose piece can be removed to expose the wide metal radiator and underbody, adding to the car’s posing options. The No. 14 is surrounded by the stylized G that was Gilmore’s logo and Gilmore decals are on the cockpit’s sides along with a white cowboy hat decal symbolizing Super Tex, the driver. Rear wings were downsized for 1974 to stay within the space between the rear tires’ inner edges and this one includes rivets molded into it, plus Valvoline and Goodyear decals. 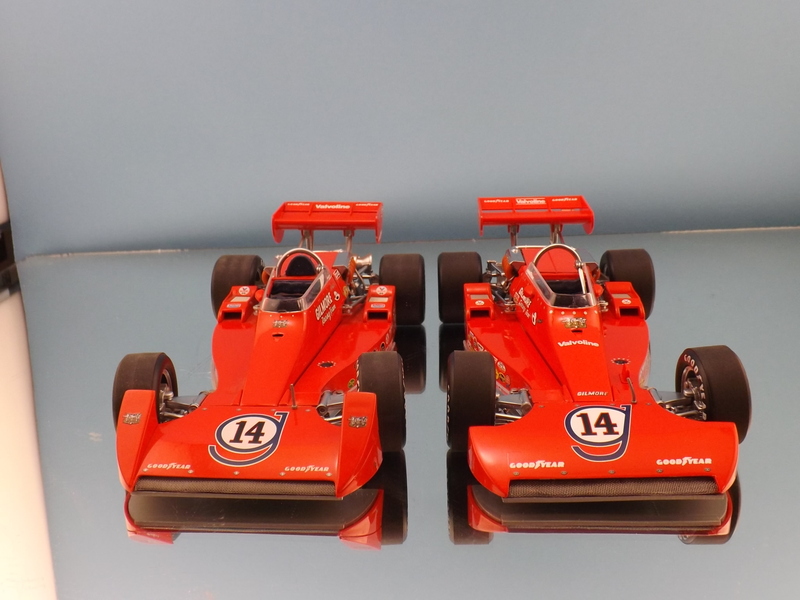 Notice the difference in the noses of the ’77 Indy winner, left, and this ’74 pole car of Foyt’s. Wheels are six-spoked chrome with a six-sided wheel nut and the tires look like scuffed in race slicks. The cockpit has a flat black race seat with photo-etched metal lap clasp, a small shifter along the right-side cockpit wall and flat-bottomed racing steering wheel. Only a few gauges, as were standard at the time and these look realistic with glass faces. I thought Replicarz new 1967 STP Paxton Turbine was a beautiful model, but this Coyote is its best piston-engined model yet. Super Tex should be proud! Here you can see some variations in the ’77 car, left, and ’74 Coyote. For instance the rear wing shrinks and takes a different shape in ’77.